At its simplest Alcohol Units Calculator can be used to take the pertinent information about a drink (its percentage alcohol and the volume consumed) and from that calulate the number of standard units in the drink. If you wish you can also record the units consumed and have this information, along with all the other drinks you have added, give you an idea of how many units you are consuming daily, weekly and monthly. You are free to interpret this information as you want. You can add a value for Units per day but yu don't have to. This value can be the recommended amount or it can be a value you are happy with. The App is designed to be non-judgemental. You decide what to record and what not to. You decide how to interpret the charts. 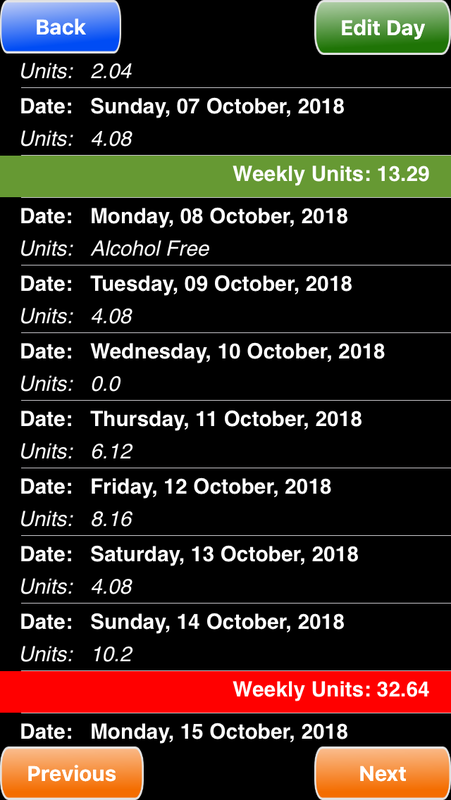 If you think you are drinking too much based on the information shown then it is your choice to do something about it - the App will not tell you do anything. The Quick button has been added. This allows you to quickly add the same drink to the current day. The last five (different) drinks you entered will be shown. If you have a few drinks you regularly consume then they should stay in this list. Delete also uses the same five drinks so that they can easily be subtracted. The Month View now shows total units for the week and a monthly units total at the end. Colour coded to show how you are doing; red for over units for week/month, green for under units. It can be selected for any day - you will be asked to confirm the selection if the day already has units added. 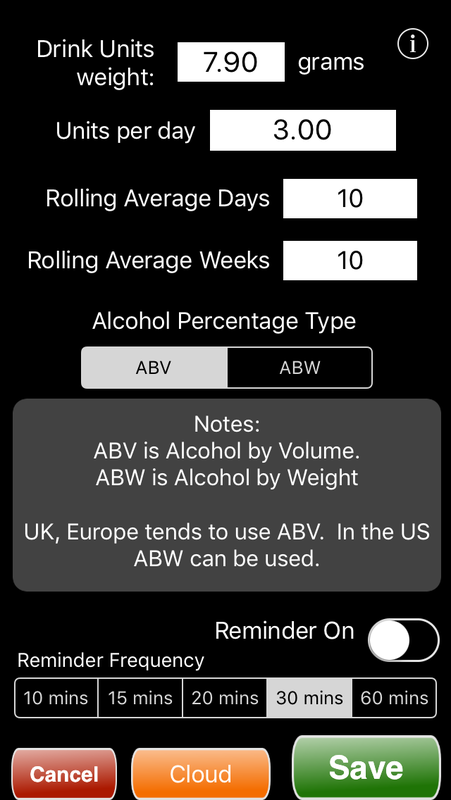 On the Apple Watch App an Alcohol Free Day will be shown with the three letters 'AFD'. You can change the units per day by selecting the field and entering the new value using the keypad. How many units you allow per day is up to you. The recommended level is 14 units a week for men and women. So for both men and women it's 2 units a day. If you do drink as much as 14 units week it is best to spread this evenly across the week. The recommended numbers are by the UK National Health Service - other countries have other limits. It is completely up to you what you set your limit at. 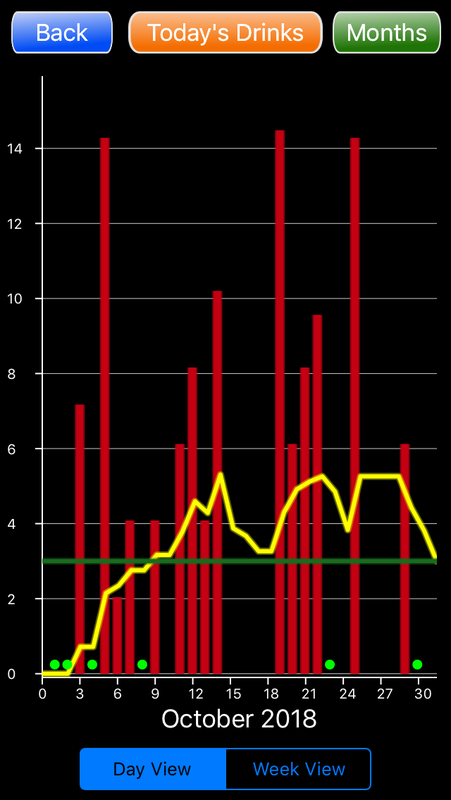 You can now set the number of days that are used to calculate the rolling average line (the yellow line on the graph). It has always been set to 10 until now. You can now choose the number to use. The minimum is 2. Depending on where you are alcohol percentages can be specified by Volume (ABV) or by Weight (ABW). You need to be careful when assessing which it is because ABW shows lower numbers than ABV e.g. A beer with ABW of 4% is in fact 5% ABV. The reminders are there to remind you it may be time to add another drink. It does this by sending a notification to you via the standard system notifications. Enable it using the reminders on switch and set the number of minutes between notifications. While the reminders are on you will receive one notification every number of minutes you entered. To cancel all reminders just set the enable switch to off and save. You can enter any number you like for the number of minutes. The App will attempt to use that number. Only integer minutes are allowed. Try and make the number selected a divisor of 60 (the number of minutes in an hour). Good values would be 10, 15, 20, 30, 60. Other values may result in more or less reminders than you would expect. Any number over 60 will result in a reminder after that time and thereafter one every 60 minutes. Select 'Save' to save the new preferences. Select 'Cancel' to not save the new values. Deleting Units from a Day. You no longer have to delete all the units for a day. Press the red octagaonal trash icon on the main screen and an alert is shown. Enter the number of units to delete in the field and press Delete. Those units will be deleted from the total for the day. Unlike many other things there is no standard Drink unit size/weight. Many countries do not even have a definition of what is a standard unit. This has made the App hard to make applicable across all countries. I have chosen to use grams because this is how a number of countries define it - in grams of ethanol (alcohol). You should be able to look up what your country's definition of a units is (if it has one) and type this value into the weight field. This App was written assuming that there are only 7.9 grams in a unit - the UK standard. This results in more units being reported than would be in other countries. Australia uses 10 grams in a unit, the US uses 14 grams. The more grams in a unit the more alcohol is needed to make a single unit. If you country is not listed then you will have to decide what number to put. I would recommend using 7.9 grams - the value the App has been using from the start. Note: If you do use a value other than 7.9 grams then this will change all the calculated units from that point on. 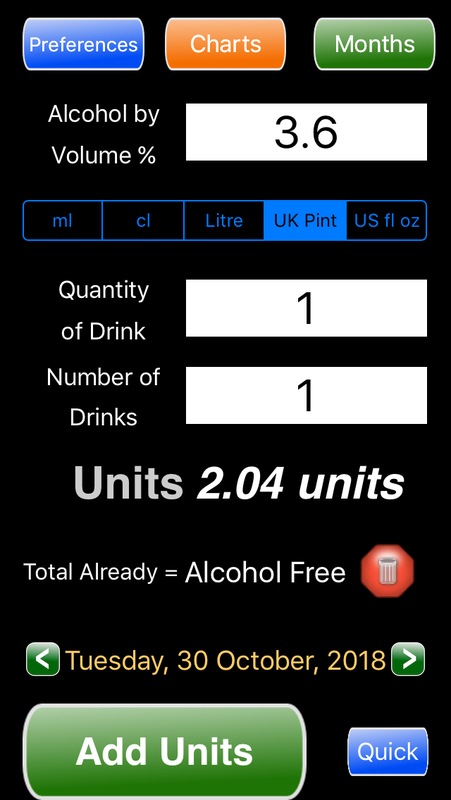 The App is not going to retrospectively go back an adjust all of the saved drink units. You can send me a support request via email by selecting the 'Support' button (in the help viewer). I will endeavour to answer all emails within 24 hours.